Any time a Castlevania game is discussed it always has to be done with a mention if a game came out before or after Symphony of the Night. That pivotal title has cast a shadow over everything that's come since, even for games that aren't really Metroidvania clones. Case in point for Lament of Innocence. 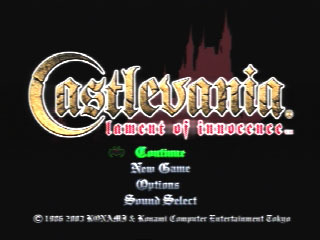 Released after a string of handheld games, Lament was a return for the series to consoles, a second attempt for the series to make a 3D game (after what some consider the disastrous entry, Castlevania 64). With a lot riding on it, Lament ended up a game serving many masters without really doing any one thing really well. Set long before the adventures of the Belmonts against Dracula, Lament follows the story of Leon Belmont, a hero back from the crusades looking for a little peace a quiet. Unfortunately, an evil vampire, Walter Bernhard, kidnapped Leon's wife and it was up to this hero to track down the vampire and save his wife. In the process, Leon sets up many of the conventions of Castlevania lore, giving explanations to such things as, "why do the Belmont's have a magical whip?" and "why are they so down against vampires?" Story-wise, the game makes about as much sense as any Castlevania game -- it's not too heavy on plot, and we all pretty well understand "go to an evil vampire's castle and kill them because reasons." What hurts the game, though, is that it can't quite figure out if it wants to be a 3D platformer or a Metroidvania game. While the RPG elements of the series were stripped out, Leon still had to go back and forth through the sections of the castle searching for powerups to get him to that one next area. Coupled with rooms that felt more like battle arenas (with forced fighting to little benefit) the game wasnt quite an action game, but it wasn't really an RPG adventure either. Instead it was just a bit of a mess, leaving the series without a strong 3D game for some time to come. Sadly, things aren't going to go so well for Leon. His woman, Sara, is taken by the Vampire Walter Bernhard (they were early times, when a man could use the title "Vampire" and not immediately have a stake thrust through his chest). Leon storms to Walter's castle to defeat the goddamned bathead and save his beloved. Some of the upgrades are welcome -- such as whips increasing in strength (interestingly, modeled after the Belnades magic types: ice, lightning, and fire). He'll also be able to collect the standard sub-weapons (axe, dagger, cross, holy water, and newcomer crystal), and when combined with seven different orbs he'll collect over time, Leon can create a variety of attacks and effects (like the DSS and Sub-weapon/Spell combos from previous games). As with previous games, these combinations may prove more or less helpful depending on your tastes and what kind of attacks you're looking for.